Posted on June 27, 2013 at 8:04 pm. Click here to see these and other color/design options available in our online shop! We have a small inventory of these delightful summer house beauties. They will not last! Ranging in size from 3′ x 5′ to 3’2″ x 8’2″. 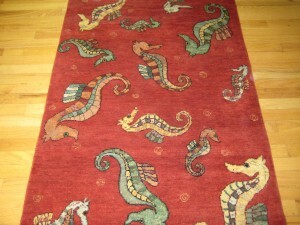 Please feel free to call us about other patterns (seahorses, turtles, fish, lizards) and color options.